It’s not every day that we can teleport ourselves to the world of high fashion and style. But tonight, Friday, March 24, 2006, you can! Join us at the Stylehive virtual headquarters in Second Life for a fashion show to celebrate the launch of Stylehive.com. Don’t miss the Stylehive virtual event featuring Second Life models and designers, as well as celebrity judges (Gina Pell, CEO of Splendora.com). See the Stylehive blog post, Hot Event: Fashion Show at our Virtual World Headquarters for more details. For those of you who can’t make it, we’re going to record some movies and will post those afterwards so check back at the Stylehive blog or here. If you miss this event, never fear. The virtual world is always available. 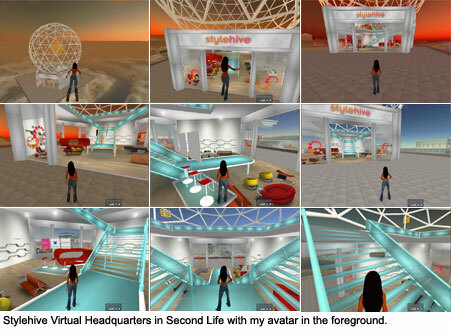 You can visit Stylehive virtual headquarters at any time in Second Life. The modern structure and interior was designed by Aimee Weber, SL fashion maven, and includes many interactive elements pulled directly from the Stylehive.com bookmark community. See the biomorphic red couch? Click on it and launch your browser to the Stylehive bookmark about this object to learn more. It’s Baudrillard’s theories of simulacra and simulation in action. Go now, and experience it for yourself.